The most iconic movie theme tune of all time. Duuun dun duuun dun dun dun dun dun dun dun BOM BOM dun dun dun dun dun dun doo dedoo doo dedoo dede doo dede doo dededoo! It's the sound of fear. Although written down it all looks kind of fun doesn't it? But it's not. Make no mistake, those few bars of music struck terror into the hearts of cinema goers back in 1975. No one went swimming in the sea afterwards without hearing those two notes being played in their heads. John Williams created something that sounded like a shark attack, something that everyone knows and everyone can relate to. Sure he went on to make more and more iconic soundtracks that would fill most of our lives and certainly any of us that grew up in the 1970s and 80s can recall them at a split seconds notice. Apart from Superman, which almost always ends up as Darth Vader's theme from Star Wars, in my head at least. 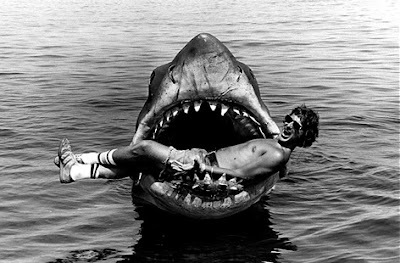 Jaws was that perfect blend of a movie. Genuinely scary and made by a bunch of people not fazed by the special effects restrictions of the time. But without that theme tune, that still sends a shiver up your spine, would it still be as iconic? I doubt it. It is not safe in the water. Do not get in. Tonight's post is dedicated to (from Twitter) @Bertswattermain, @Giusep03, @LifeUniStudent, @MrsR1ck, @BintySquirrel, @WH1SKS, @domcoke, @clarkycat, @RickHarwood and @Fyb3r_Optic. And that's it, the last iconthursday of 2010. Back in January.